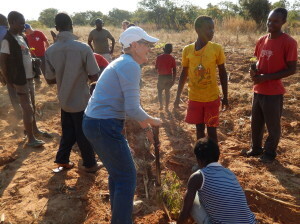 Sue, a member of the mission team, plants moringa with the children. 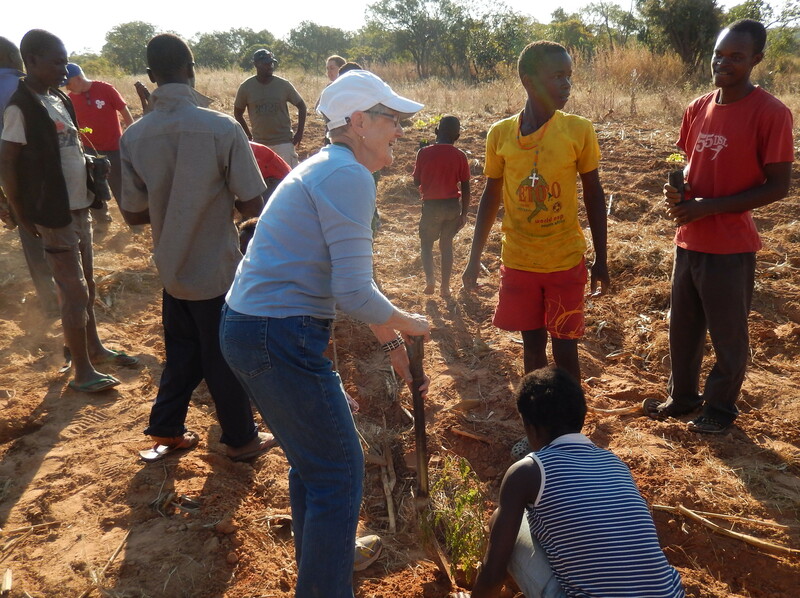 After the successful completion of the tilapia pond at the Sunflower Family Orphanage in June of 2013, we’ve moved onto our next project of planting hectares of moringa trees. These “miracle” trees grow to maturity in 1 year, and research shows the leaves have a nutritional powerhouse of protein, calcium, vitamins and minerals. We have planted our pilot project of 100 seedlings, and if successful, we will plant several hectares of these plants in hopes of feeding the 100 plus children at the orphanage. The moringa can be put into soups, made into tea, or eaten as a green salad, and the excess will be fed to the livestock. Feeding the livestock will save a tremendous amount of money now spent on animal feed. We very excited about these plants, and the research we’ve read over the past 2 years. During our 2013 trip, we visited a Zambian operation that is using these trees to feed all their healthy animals. I am looking forward to expanding this project, and designing recipes to make this a daily nutritional supplement to the diet of the children, especially the girls who are very calcium deficient. ne of the greeters who came to meet us upon arrival in the village was in his Sunday best. I noticed that one pant leg was torn most of the way up the side, but he was so proud to be chosen to welcome our team. Some people had no shoes or ones that didn’t fit. Want to follow all of our latest progress? Keep up-to-date with all of the news by signing-up for our email newsletter. © Copyright Mission Possible : A to Z - All rights reserved.